In my previous post I spoke about my time with Birmingham Royal Ballet at the Theatre Royal Plymouth for their production of Beauty and The Beast. Not only did I have the opportunity to check out some of the amazing costumes, makeup and wigs, I was also taken on a tour of the stage and backstage area to find out more about how the props and staging works. Walking through the backstage corridors I got to experience the exciting atmosphere just minutes before the curtains were due to go up; Dancers were getting into their costumes, ushers were ready in their uniform and the tannoy system called "thirty minutes until stage time!" (which it was actually thirty five minutes to go, but they add an extra five minutes so that none of the dancers are late!). One thing I noticed backstage were these wooden boxes placed in every corridor- they are rosin boxes with graters which the dancers use to scrape their ballet shoes on to stop from slipping on the smooth surface of the stage. Then I was taken to the stage area where all of the props were ready to be used in the show. 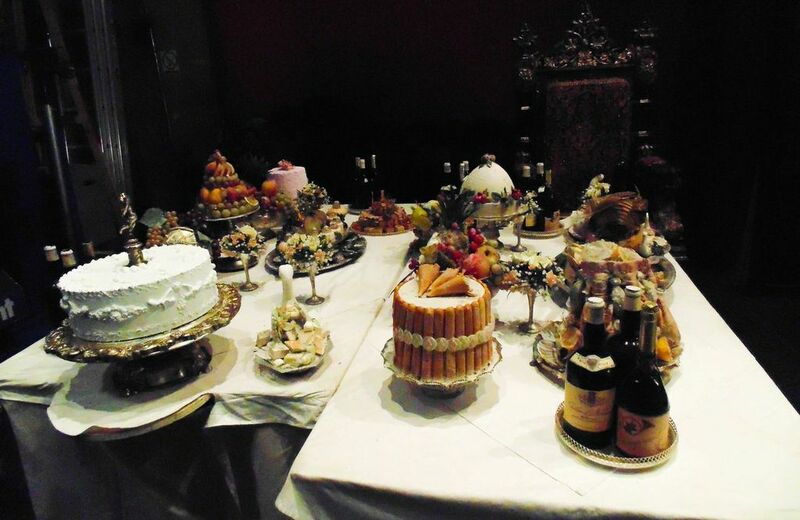 My favourite props that I saw were the tables of food and drink for the banquet scenes which although were all fake, definitely looked like it could be edible! I loved the detail in all of the props, like the small decorations on the cakes and glazing on the pig head. 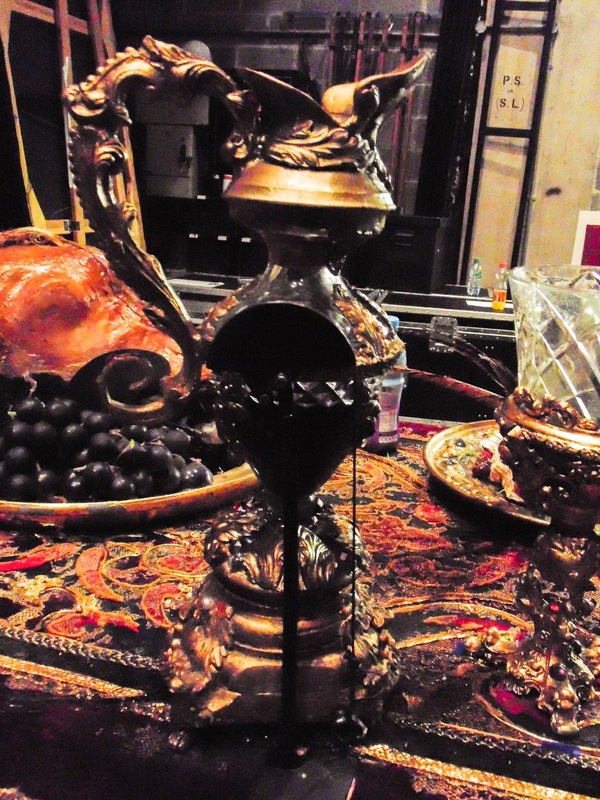 One of the tables featured in The Beast's castle in the show, therefore possessed magical powers and could light candles and pour a goblet of wine all by itself! (Big backstage secret here...) But I learnt that actually a person was lying underneath the table and controlled all sorts of buttons and wheels to activate the magical actions- oh and the 'wine' is cleverly just Ribena juice! The tricks of the theatre! 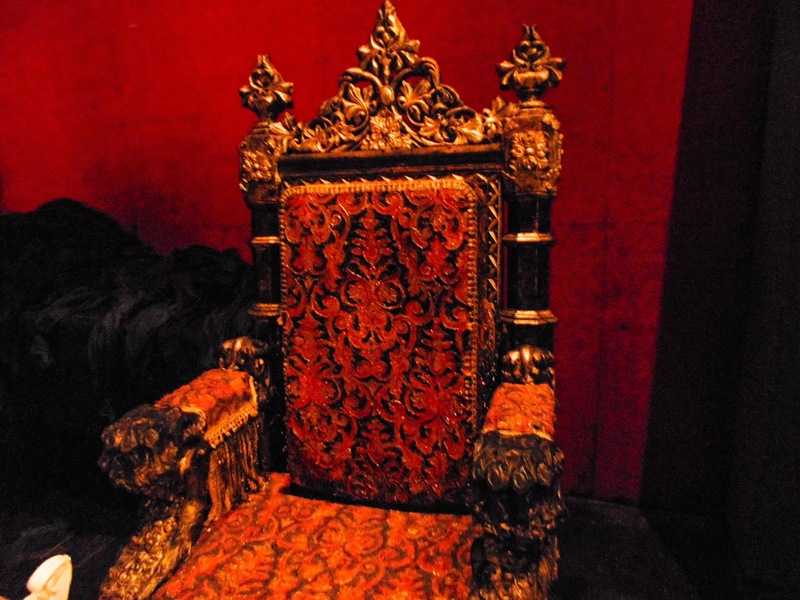 Similarly the magical chair of The Beast's castle was also controlled by a person sat inside the chair with their arms in the hollows of the armrests which caused the chair to lovingly give Belle's father a hug in his time of need. I found this so interesting as I had never previously given much thought to how certain props were operated in the theatre yet it was done so cleverly. The staging on the show was fantastic. 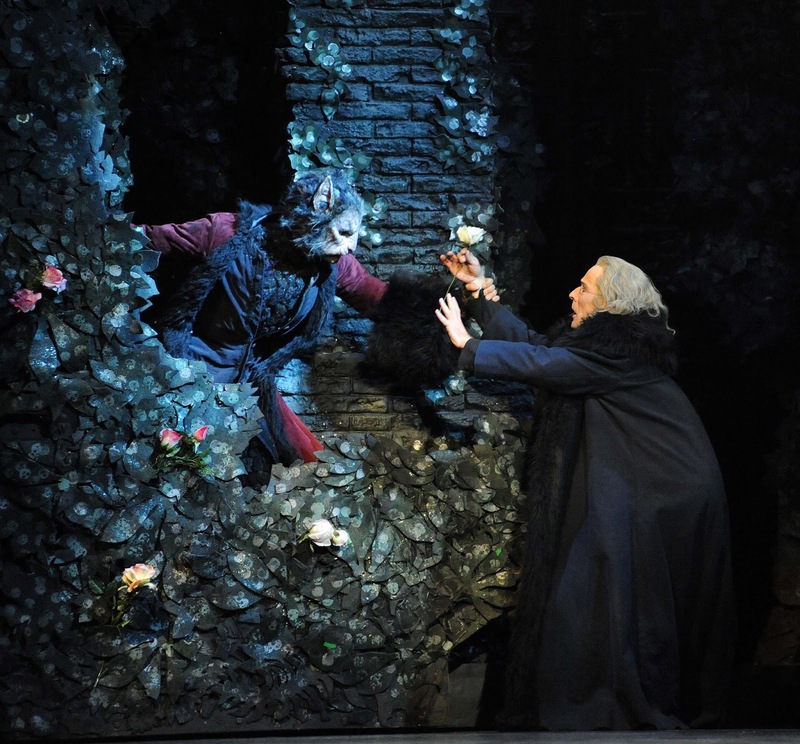 The backdrop consisted mainly of dark and almost menacing looking scenery, especially around the appearances of The Beast which suited perfectly the story of the ballet which was based on a more sinister outlook of the traditional folk tale, where David Bintley (Director) focused on the fact that "it is the humans who can be beastly". I particularly liked the use of mirrors in some of the scenes as they created amazing shadows of the dancers and props. There was interesting use of light and shadow throughout the show, it was used as a platform to convey the atmosphere greatly in addition to the dance. As a self- confessed musical theatre lover, a ballet is something a bit different for me and I was somewhat skeptical of how much I would enjoy it as I usually love the singing and conversational aspect of shows. However I can honestly say that I loved the ballet of Beauty and The Beast by Birmingham Royal Ballet so much. The dancing was some of the best I have ever witnessed, with every move and motion perfected down to a T. The story was very easy to understand and there was some added humour of the rabbit and the aristocrat characters which lightened up the intense but compelling story line. The props, costumes, wigs, makeup and staging along with some breathtaking dancers created a show that I would happily go and see again and again. I would definitely recommend you go and see Birmingham Royal Ballet's Beauty and The Beast which is currently touring around the UK. Otherwise Birmingham Royal Ballet put on a vast variety of different ballets and will be back at the Theatre Royal Plymouth in Spring! Disclaimer: I have worked with the Theatre Royal Plymouth and Birmingham Royal Ballet to create this post but all thoughts and opinions are 100% my own! Photos marked with an asterisk are credited by Birmingham Royal Ballet. Thanks to James from J-D Photography for editing some of the photos for me. Let us see primark birmingham on-line shop to get a vast assortment of most kind of searching stuff. For many ladies searching for a bit of glitz and glam, then Birmingham's luxury Jewellery Quarter will be where to become. Home to over 400 jewellery organization, buyers ' are spoilt for choice.You can start shopping through primark birmingham online store.